We had a requirement to modify Vary Response Header to 'User-Agent' for mobile site SEO for google. Have you faced a situation that your changed Vary header is not getting reflected on the Response Headers on ASP.NET webpage? Above code failed so we also tried to append these headers at Page_LoadComplete and context_EndRequest event(last event in page life cycle) assuming that the headers were tampered in between (Between Page_Load and context_EndRequest). 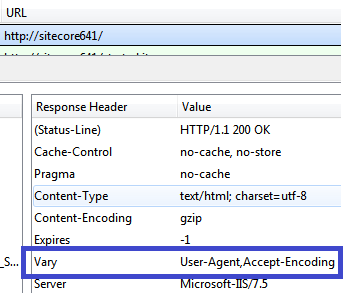 See below snap, showing our code not working, means showing Vary as 'Accept-Encoding' instead of 'User-Agent'. So, something strange was happening here. One thing was sure that the headers are overwritten from IIS level, because our modified headers set in context_EndRequest event(last event in page life cycle) were also getting overwritten. 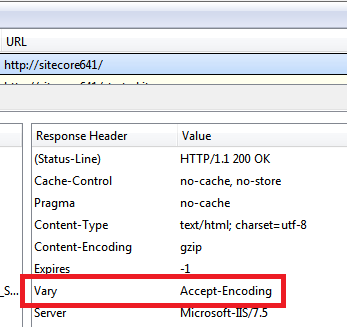 After spending few hours, I came to know that dynamic compression module from IIS overwrites the Vary header to 'Accept-Encoding'. Disabling this module solved our problem. Such a nasty bug it is!! After installing this HotFix, this issue is resolved!! We can now play with Vary header along with Dynamic Content Compression module! !